HARLEY-Davidson already has a Sportster in its lineup, in fact it has half a dozen of them, but I reckon the V-Rod Muscle is Harley’s true Sportster. With over 120 horsepower and crap loads of torque from the 1250cc liquid-cooled engine, this is Harley-Davidson’s most powerful production motorcycle. And with a top speed over 200 km/h no other Harley-Davidson, unless it’s substantially modified, is going to stay with a V-Rod. But is the V-Rod Muscle all engine? Does the rest of the bike allow you to explore the performance of the engine? Well it does to a point. Weighing in at just over 300 kilos ready to rumble, with a 240 rear tyre and a wheelbase of 1.7 metres it is more of a traffic light racer than it is a track star. That’s to be expected, and to be honest it doesn’t detract from the riding experience. You know what this bike is good at just looking at it. But that doesn’t mean the bike can’t be fun riding windy road conditions, you just have to muscle it through corners a bit more than a bike with a smaller rear tyre. That said, that fat rear tyre does look pretty good, and is a big part of the styling. The engine is totally different to an air-cooled Harley donk, and feels it. The 60 degree V-twin Revolution engine in the V-Rod revs quicker, revs higher and accelerates faster. This is helped no end by its short stroke. The five-speed gearbox is slick, and first gear is quite tall. It also has a slipper clutch, something you’d usually find on track focused bikes. You can feel it working when braking hard for a corner and cranking down the gears.. And pulling it up is dead easy, with the four-piston calipers front and rear having no issues bringing the bike back down from high speed, and as you would expect, the low centre of gravity, long wheelbase and the raked out front end makes sure it’s stable doing so. On the open road the bike is fun to ride, once you have it sorted and into the corner the bike feels very stable, and the 34 degree raked out inverted forks work surprisingly well. It could have more ground clearance and the rear suspension could have more travel but for this type of bike it gets itself around corners better than you might think, especially on smooth roads. 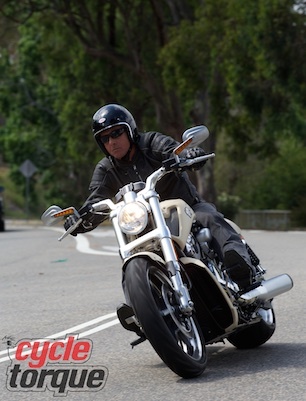 If you’ve never had much to do with cruisers, even sporty ones like the V-Rod you are better to adapt your riding style to the bike rather than expect jt to cope with your style. On tight roads with a good surface you can ride the V-Rod a lot faster than you might think by the look of it, more so if you adopt the point and squirt method. And it has plenty of squirt I can tell you that. Overall the comfort side of things is pretty good, and racking up decent milages is easy enough without making you feel like a violated contortionist at the end of the day. A friend of mine has a V-Rod and he’s fitted a small screen, saddlebags and a short back rest, and with these accessories he tours the bike regularly. The fact it’s got a 19 litre tank helps here too, it can go decent distances between fuel stops. 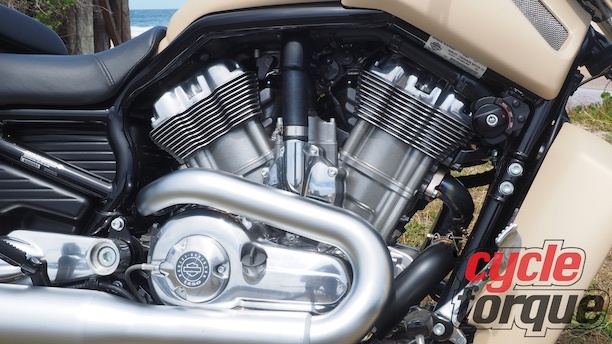 The V-Rod Muscle has a sweet engine. 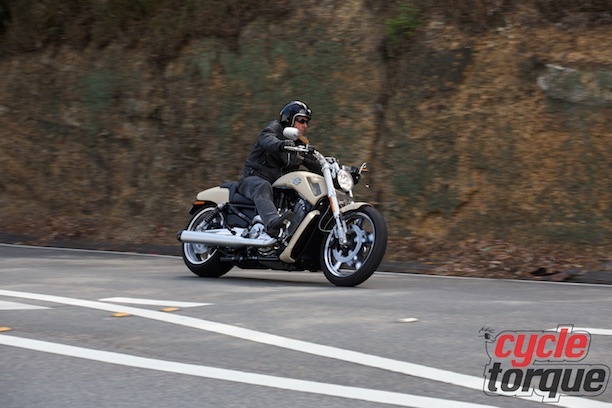 It likes to rev and really has some top end mumbo, something air/oil-cooled Harley-Davidson engines are not renowned for, and the engine really does suit the ethos behind the V-Rod. It’s not to everyone’s tastes I guess as it’s a more, dare I say, modern Harley, and that’s probably not what most Harley buyers are looking for. That aside, the whole mechanical package – and by that I mean the drive-train – of the V-Rod Muscle is one of refinement. The other mechanicals work well in the overall scheme of the bike too. I like the overall look of the bike but the one thing I don’t like are the mufflers, I much prefer the stacked pipes of the Night Rod Special, the only other V-Rod Harley-Davidson sells in Australia. But that’s easy to change if you want to, it’s always a subjective thing and has nothing to do with how the bike actually rides. As for the aural pleasure the standard mufflers sound good, they are not overly quiet. Same goes for the sand colour, not my go but hey you can get other colours. Priced at $26,995 it’s what I’d expect to pay for one, and prices have not gone up much in the last few years or so, just like our pay packets. I think if you’ve been wondering about being a part of the Harley lifestyle but at the same time you want to stand out from the crowd you should look at the V-Rod Muscle. Even though it’s the sportiest of Harley-Davidson’s offerings, and the most different, it still has enough Harley heritage in its DNA to do what a Harley does best, and that is cruising along, letting its rider enjoy life in the best possibly way. On a bike.